On New Year's Day 2019, a spacecraft known for its historic flyby of Pluto will take an unprecedented look into the distant past by flying right up to a frozen remnant of the original solar system. Planetary scientist Marc Buie plans to celebrate New Year 2016 playing charades and talking quietly with family and close friends. However, if all goes according to schedule, Buie and some of those same friends will be ringing in the year 2019 by cheering a cosmic milestone—the first close-up portrait of a denizen of the outer solar system that has likely remained undisturbed and unexplored since the birth of the planets some 4.5 billion years ago. On 1 January 2019, pending funding approval by NASA, the space agency’s New Horizons spacecraft is poised to buzz this frozen, presumably pristine relic, known as 2014 MU69, at a distance of about 6000 kilometers. That’s half the distance from which the craft took its historic close-ups of Pluto and its family of moons on 14 July 2015. Only during the last 7% or so of its more than 3.5-year journey from Pluto will the New Horizons probe be able to even catch a glimpse of its remote target. When that encounter happens, scientists expect to find a tiny, frozen world locked in time and space in the shrouded and mysterious era and place of its birth. Circumstantial evidence suggests that since it formed, 2014 MU69 has not changed in orbit, composition, or temperature, researchers said. For some 4.5 billion years, it has simply floated, unperturbed, like a perfectly preserved mummy from a creation event that is both chillingly alien and comfortingly personal: the event from which our planet and most everything else that circles our Sun today arose. Because 2014 MU69 is so faint, the craft will rely on the powerful lenses of the Hubble Space Telescope to help it find its way. Only during the last 7% or so of its more than 3.5-year journey from Pluto will the New Horizons probe be able to even catch a glimpse of its remote target. On the way or when it gets there, scientists plan a range of investigations, including whether volatile substances such as nitrogen and methane are leaking out of the object’s interior, whether it has a moon, and how common moons are for objects of its type, New Horizons’s mission scientists said. Other residents of the outer solar system seen up close have been battered about so much since their formation that they cannot take investigators directly back, like 2014 MU69 presumably can, to that early era, in which small bits of gas, dust, and ice coalesced within a swirling disk encircling the young Sun to build the solar system’s orbs. Although both Pluto and 2014 MU69 are members of the Kuiper Belt, a doughnut-shaped reservoir of comets and other icy bodies in the outer solar system, 2014 MU69 occupies a section of the belt that appears to have suffered few disturbances during the billions of years since it arose. Also, unlike Pluto, residents of this region, known as the cold classical belt, have orbits that are nearly circular (rather than oval or “eccentric” in planetary science parlance) and hew close to the plane in which the planets orbit the Sun. These properties suggest that 2014 MU69 and its neighbors have not been stirred up by collisions or gravitational interactions with other bodies, and look pretty much the same as they did when they formed, astronomers say. On the other hand, Pluto and its moons appear to be debris left over when two icy bodies crashed into each other. Although scientists had been searching with ground-based telescopes since 2011 for an object that New Horizons could visit in the cold classical belt, they had come up empty-handed and were beginning to get anxious. Then, in the early summer of 2014, New Horizons scientists got their first survey images from the Hubble Space Telescope, which can see much fainter members of the Kuiper Belt. Scrutinizing the Hubble data, Buie immediately identified a Kuiper Belt object that might be a candidate for New Horizons. “Hope you’re sitting down,” began an email that his New Horizons colleague Alex Parker sent to the rest of the SwRI team on 22 August 2014. 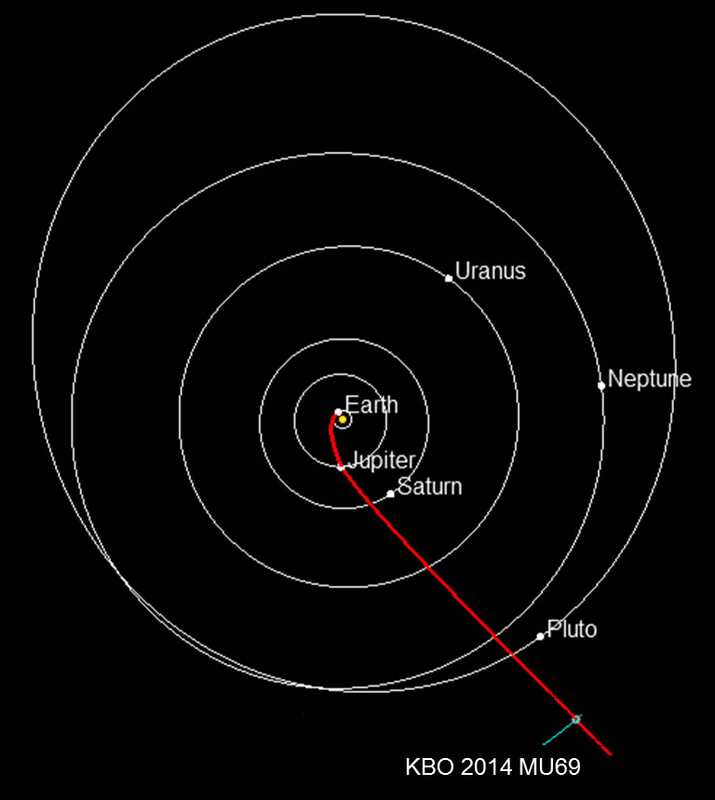 Simulations showed that the object, 2014 MU69, had passed every test. NASA won’t decide until the fall of 2016 if it will fund the 2019 flyby, but scientists couldn’t wait for the funding to come through to begin preparing to seize the opportunity; they needed to fire New Horizons’s thrusters in the fall of 2015 to nudge the spacecraft onto a path that will place it near 2014 MU69 on New Year’s Day 2019. The last of four ignitions was completed on 4 November 2015. Because the object is so faint, the cameras on New Horizons won’t be able to see the body until a few months before the flyby and will rely on additional observations with Hubble to home in on the target. To learn as much as possible from 2014 MU69, scientists are devising a strategy for the eventual flyby. How close should the craft venture to the object? The farther away the spacecraft lies at closest approach, the easier the encounter is to accomplish, but the images won’t be as sharp. Get too close, and the speed of the craft as it flies past could smear the images. “It’s risk vs. reward,” said Buie. Scientists are still debating encounter plans, but it’s likely that the craft will pass within 6000 kilometers of 2014 MU69. Observations with Hubble every year until the encounter will be crucial in pinpointing the location and orbit of the Kuiper Belt object, he added. Researchers are also deciding whether to observe 2014 MU69 on the sunlit (day side) or the night side of the object. For scrutinizing Pluto, New Horizons scientists had opted to have the craft pass on the night side, even though dayside illumination would have yielded more spectacular images of the surface. The nightside observations enabled the craft to view Pluto during a solar occultation, with the Sun backlighting the dwarf planet as the craft passed through Pluto’s shadow. This configuration yielded breathtaking views of the halo of gases in Pluto’s atmosphere. However, 2014 MU69 is a much smaller object and isn’t likely to have enough gravity to hold an atmosphere. Scientists therefore plan to observe the object on its day side, with the faraway Sun doing its feeble best to illuminate the icy body. Although 2014 MU69 may be too small to retain an atmosphere, its size offers its own fascination to scientists. The object spans about one hundredth the diameter of Pluto, while looming some 10 times larger than the Kuiper Belt comets that visit the inner solar system. Because of its midrange girth, 2014 MU69 is “the critical connecting dot between the two types of objects,” said Alan Stern of SwRI, who is New Horizons’s lead scientist. Observing an intermediate-size object will provide new information on how vastly larger planets assemble from chunks of rock and ice, Stern predicted. Buie and his colleagues look forward to discovering if 2014 MU69 has a moon. Researchers estimate that satellite companions orbit at least 30 percent of Kuiper Belt objects, a number that New Horizons researchers said they hope to refine as the craft observes from afar some 10 to 20 denizens of the belt before and after it homes in on 2014 MU69. Because the body is so faint, scientists won’t be able to discern whether it has a satellite until October 2018, when New Horizons’s cameras can first image the body. Finding a moon would force mission scientists to reassess just how pristine 2014 MU69 really is. A moon could signify a collision or 2014 MU69’s capture of a passing object, suggesting a busier past for 2014 MU69 than currently suspected. The gravity of an orbiting moon would enable the team to measure the mass of 2014 MU69. Combined with New Horizons’s high-resolution observations of the body’s size, the mass measurement would yield the density of 2014 MU69, and therefore its bulk composition—its ratio of ice to rock. If the density is low—meaning that 2014 MU69 is porous—it could indicate that the Kuiper Belt object was built by an unusually gentle accretion of smaller icy bodies. In that case, the agglomeration would be so loose that it would have left empty spaces between the coalescing fragments. Determining whether the process that built 2014 MU69 was relatively mild or crushingly violent would provide new information on conditions, such as temperature and turbulence, in the outer reaches of the young Sun’s primordial, planet-forming disk. Images and spectra recorded by New Horizons should reveal whether the surface has an ancient crust of water ice or if substances such as nitrogen, carbon dioxide, and methane, which easily evaporate and escape into space, reside on the surface. The presence of these substances would imply that they are continually replenished from the object’s interior, propelled outward by some unknown energy source. After years of planning and searching for an object like 2014 MU69, added Buie’s colleague, Parker, New Year’s Day 2019 doesn’t seem long to wait. Citation: Cowen, R. (2015), World without time, Eos, 96, doi:10.1029/2015EO042761. Published on 31 December 2015.